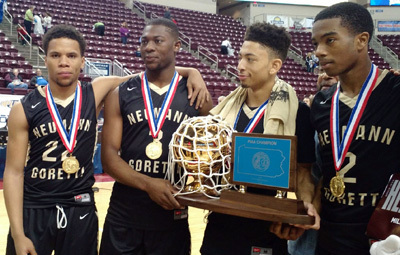 Some members of the Neumann-Goretti boys squad proudly gather around the championship trophy they earned at the PIAA state finals March 18 in Hershey, Pa.
HERSHEY, Pa. – Leaving the Palestra in Philadelphia on Feb. 21, Neumann-Goretti basketball supporters felt, in a word, miserable. Both basketball teams – the boys and the girls – had just lost in the Catholic League championship; the girls to Archbishop Wood, and the boys to Roman Catholic. Finding a smile on a Saints player, coach, or fan posed quite a daunting task. Girls’ coach Andrea Peterson said more of the same. Both coaches, however, predicted that their players still possessed enough drive and energy to make the most of the upcoming PIAA post-season. Just give the players some time to gather themselves, they said. The season isn’t over. Fast forward to this past Friday night, March 18. Read everything above, and turn it around to be just the opposite. 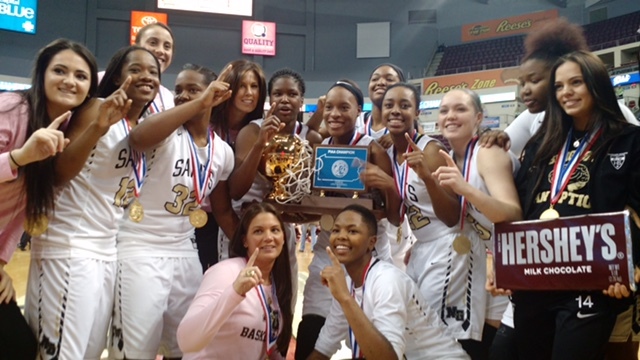 At the Giant Center in Hershey, both Neumann-Goretti teams emerged as state champions. A few hours after the girls annihilated North Star High School, 65-28, to win the Class AA title, the boys followed suit in a Class AAA tilt against Mars High School, pounding the aptly-named Fightin’ Planets by a misleadingly close 99-66. Both teams had successfully defended last year’s crown, though for the boys, it marked their third straight and sixth state championship in seven years. In the process, the boys established a new state championship game record for points and simultaneously tied another record for largest margin of victory in the 97 years of the PIAA’s existence. Mars coach Rob Carmody was impressed. The Saints (27-4) connected on a stupendous 20 of 28 shots in the first half; nine of 15 from three-point land. They held a comfortable 53-33 lead at the break and barely let up afterward, finishing 38 for 63 overall and 11 for 24 from long distance. Mars had no answer for other Saints such as senior Rasheed Browne (18 points, seven rebounds, seven assists), junior Dhamir Cosby-Roundtree (nine points, eight rebounds, two blocks) and senior Vaughn Covington (11 points). Many of the Neumann-Goretti girls stayed around to watch their male counterparts, undoubtedly in a happy mood throughout the six-hour lull before tipoff. Their championship effort befitted a surgeon’s approach to an operation – methodical, confident and thorough. As they did during their state title march last winter, the Saints (29-1 this year, 59-1 over two years, and 88-2 over three years) did not toy around with any of their opponents. The unfortunate North Star squad (28-3) was barely able to get the ball up court, as the Saints forced 27 turnovers. Junior Chyna Nixon (14 points, 6 rebounds, 3 steals), senior Kamiah Smalls (11 points, 4 steals), senior Morgan Lenahan (10 points), and sophomore Jabria Ingram (six points, six steals, four rebounds) also enjoyed stellar efforts. N-G’s players echoed their coach, Andrea Peterson, who constantly preaches the importance of defense. Never had the Saints been as dominant. Players from both squads said that having both genders win a state championship is especially meaningful because it benefits the entire community. They should know, for this is the second straight season that both teams returned home with gold medals. It also means the season is over, and that saddens Peterson. “They wore that uniform proudly,” she said.